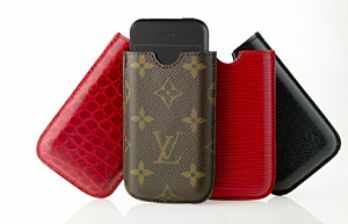 Louis Vuitton seems to be the first luxury fashion house to roll with the pace of technology launching their new line of iPhone cases this week in four classic LV styles: monogram canvas, taiga leather, epi leather and alligator skin. The prices range for $225 for the monogram canvas or up to $1120 for the alligator skin. Right now, the cases are only available at the Louis Vuitton Fifth Avenue flagship store in Manhattan. Then later in October, they'll be available to the masses.